Temporal disparity and intensity fluctuation of photon pulses in a polarization-based QKD system with and without side channel effects. Quantum key distribution (QKD), whose security is guaranteed by the laws of quantum physics, provides unconditionally secure key distribution between two distant parties. The fundamental principles of the security are based on the properties of the quantum states, such as the no-cloning theorem and superposition. However, this theoretically proven unconditional QKD security is sometimes threatened because of hidden implementation loopholes in practical systems. The most common configuration of the free-space QKD system implemented with multiple semiconductor lasers can also be insecure because of the potential side channel effects of time and intensity fluctuations in the output photon pulses, especially when it is operated in high-speed conditions. To eliminate such side channel effects, laser sources must be biased at a high direct current (DC) close to the lasing threshold level. However, this approach unavoidably degrades the performance of the QKD system because of spontaneously emitted noise photons from laser diodes. The aforementioned side channel effects and the performance of the QKD system with and without the side channel effects are reported in Photonics Research, Volume 6, No. 3, 2018 (H. Ko et al., High-speed and high-performance polarization-based quantum key distribution system without side channel effects caused by multiple lasers). In the study, the researchers from QKD research group at Electronics and Telecommunications Research Institute in South Korea propose the temporal filtering technique as a key approach to alleviate the unavoidable performance degradation caused by the noise photons, which are spontaneously emitted by laser diodes biased at a high DC. 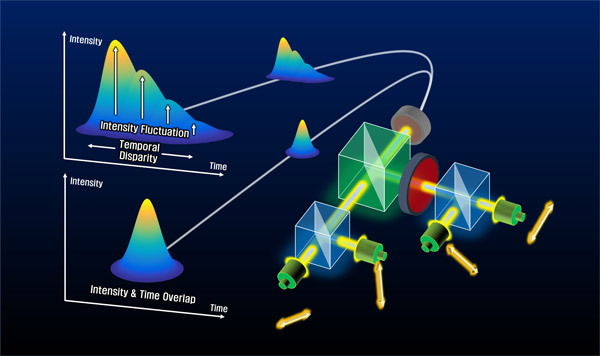 This approach eliminates photon detections in unwanted temporal regions. Using this elaborate temporal filtering technique, the QKD performances of the quantum bit error rate and the secure key rate are significantly improved, even at a high DC bias current. Dr. Youn, the QKD research group leader, believes that this work will become a key reference to achieve both security and high performance in QKD systems implemented with multiple lasers, especially for high-speed operation. Further studies can focus on the effects of multiple lasers on the performance of the QKD system in diverse situations, such as decoy systems, daylight operation, ultra-high-speed systems, and the potential loopholes caused by a high DC bias current.